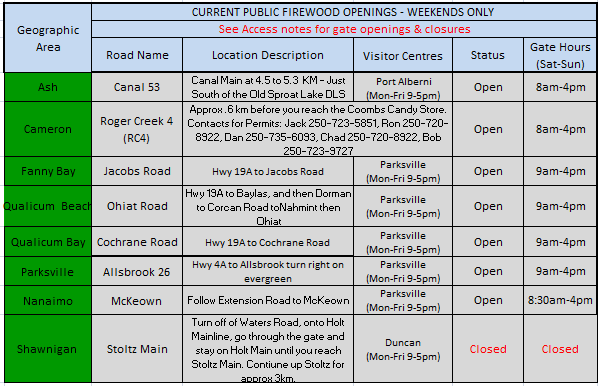 We would like to encourage you to purchase your permit a close as possible to the weekend as last minute closures of firewood areas due to snowfall are more likely this time of year. We will refund or reschedule your permit if a last minute closure occurs. 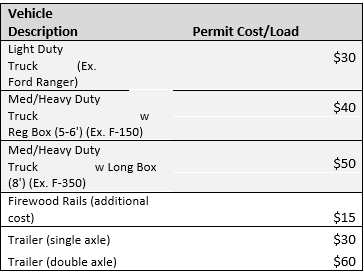 There will be random checks for Permits and Safety Equipment. If you do not have a permit or adequate safety equipment your firewood may be confiscated, and you will be asked to leave the property. Non-Compliance with these mandatory requirements may result in further penalties and restrictions. You must carry your valid permit with you at all times! There have been incidents where people have been cutting firewood in non-authorized areas. These areas may be allocated for our commercial firewood cutters and the public is not permitted to cut firewood in these areas. Please be respectful to our commercial firewood cutters and only cut firewood in the areas outlined above.